NEW YORK potential applications for this technology. In regards to the latter, 118 E. 25th St., New York, NY 10010 this edition is packed with insights on future applications. Elaine Maslin, Aberdeen offshore, look into decommissioning. ROVs and 2,400 full time personnel. 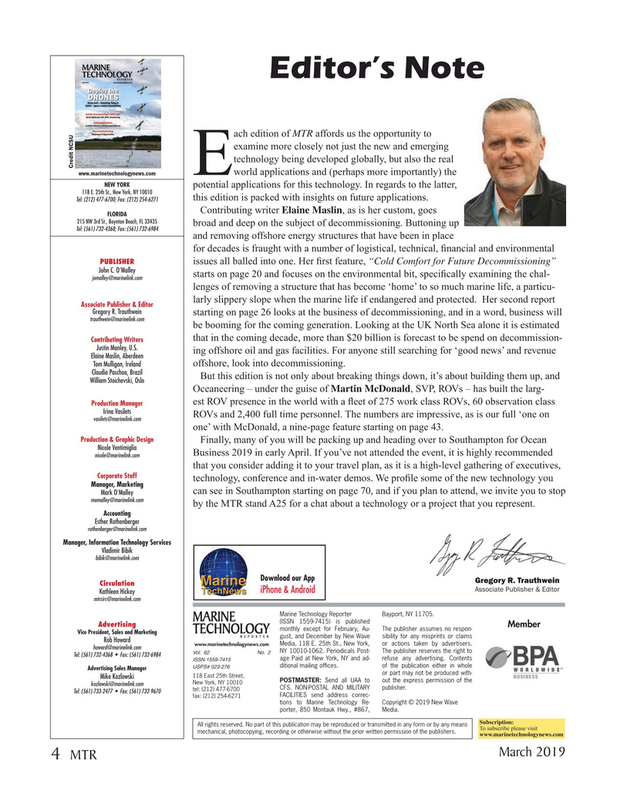 The numbers are impressive, as is our full ‘one on vasilets@marinelink.com one’ with McDonald, a nine-page feature starting on page 43. Mark O’Malley momalley@marinelink.com by the MTR stand A25 for a chat about a technology or a project that you represent. FACILITIES send address correc- fax: (212) 254-6271 tions to Marine Technology Re- Copyright © 2019 New Wave porter, 850 Montauk Hwy., #867, Media.